Researchers have identified the period when spotted horses fell out of favour, noting the remarkable rise of chestnuts during medieval times. Human preferences for horse coat colours have changed greatly over time and across cultures, an international study team has found. Horse coat colours have fascinated humans since prehistoric times. “Ancient cave paintings depicted several colour variants of wild horses, and further diversification occurred with domestication,” they noted. In the early stages of horse domestication, a rapid increase in coat colour variation was enhanced by the artificial selection of horses under human care. Spotted and diluted horses were more common from the start of domestication until the end of the Roman Empire, whereas solid colours − bay, black and chestnut − dominated in the Middle Ages. The findings of the research, led by Germany’s Leibniz Institute for Zoo and Wildlife Research, have been published in the open-access journal Scientific Reports. The study reveals that the diversity of coat colours in horses has been strongly affected by cultural differences since their initial domestication around 3500 BC. The scientists successfully undertook analysis of 107 ancient horse DNA samples, concentrating on gene-based data that provided insights into coat colour. Together with data from previous studies, this gave them results from 201 samples. In total, they detected 14 different colour types. Early breeds showed six colour variants, of which three were already present in pre-domestic horses. During the Bronze Age (2700 BC to 900 BC) and the Iron Age (900 BC to 400 AD), the number of colour variants further increased from six to nine, indicating a human preference for new colours. The occurrence of eight horse coat colour phenotypes based on their location for six different periods. or each spotted phenotype (leopard, tobiano and sabino) all samples, independent of their basic colour (bay, black or chestnut), are included. During these periods spotted and diluted horses were most frequent. However, in medieval times, the attractiveness of spotted horses decreased and solid coat colours, especially chestnut, became dominant. Religious symbolism may have played a role in the shift from dominance to the decline of spotted horses. At the start of the Middle Ages, this type was preferred by royalty, possibly influenced by the last book of the New Testament, The Apocalypse of St. John (AD 81-96). It described four riders on different-coloured horses. The rider of victory was on a white or white spotted horse, whereas the riders of famine (black), death (bay) and war (chestnut) rode on solid-coloured horses. After several epidemics. this symbolism changed: the “good” rider of victory was replaced by the “bad” rider of the plague but still sitting on a white or white-spotted horse. Consequently, white and spotted horses now had a negative connotation, resulting in a lower religious prestige of these colourations. 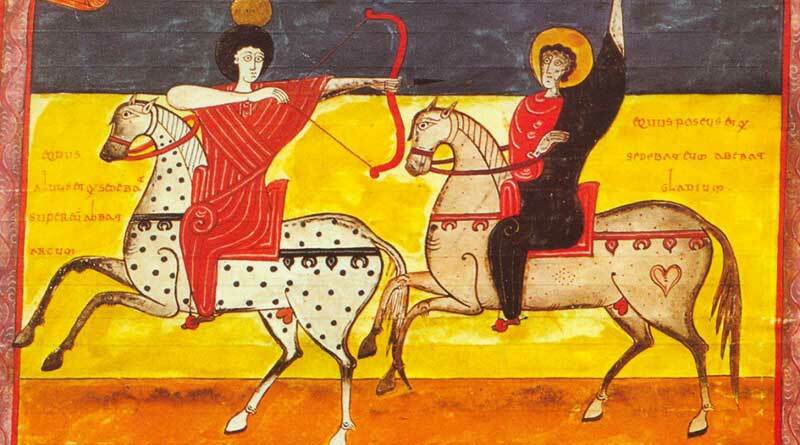 Further reasons for the decrease of spotted types might have been novel developments in weaponry such as the longbow, with these horses being an easier target than solid ones. The researchers also wondered whether the earlier preference for spotted horses might have served as a visible cue to distinguish domestic from wild horses. The strong reduction in spotted and diluted horse colours after the Iron Age had apparently started in Roman times when, according to ancient Roman records, horses with uniform coat colour were preferred to spotted horses, as the latter were considered inferior. The early Middle Ages were marked by the collapse of the Roman Empire and large-scale human migrations across Eurasia and Northern Africa. The decline of the Roman Empire caused substantial changes in animal husbandry throughout the former empire, which was also observed in changes of livestock phenotypes. So far, little information about the history of horse domestication has been available since most previous findings concerned modern breeds. “Horses have undergone extensive breeding and breed-specific homogenisation, especially during the last few centuries,” Dr Arne Ludwig, a Leibniz Institute scientist, said. This latest study is considered the most comprehensive to date, by addressing historical changes in a phenotypic character in ancient domestic animals. Its findings have important implications regarding the origin and development of modern horses. Just like today, specific breeds were preferred by people not only because of their riding performance but also their visual appearance and attractiveness. The study team also discovered that tobiano spotting, which occurs only in domestic horses and had previously only been detected after 1500 BC, was present around Kazakhstan from around 3654 BC to 3630 BC, and in Germany around 3368 BC to 3101 BC. “Similar to chestnut and sabino spotting, the tobiano phenotype appears to arise shortly after domestication, which is assumed to have started approximately 4000–3500 BC in the Ponto-Caspian steppe region (modern day Kazakhstan and Ukraine),” the study team reported. Numbers and frequencies of all spotted/diluted versus basic-coloured (solid) phenotypes for six different periods. The bar plot displays the absolute number of horses with the respective phenotype (grey represents all spotted and diluted horses, yellow represents horses with a solid coat colour). The blue line indicates the frequency of the spotted/diluted coat-colour variants, and the numbers above it indicate the significance of the changes in frequency. The researchers acknowledged that its study on ancient domestic horses contained a sampling bias because many medieval samples originated from graves of knights and noblemen. “The high frequency of chestnut coat colour among these horses fits well with horse colours of the apocalyptic riders in which the rider of war had a chestnut horse. “Moreover, chestnut horses are generally characterized as bold, which was definitely a beneficial behaviour for war horses. However, our samples do not necessarily represent working horses. “Likely, the horses of the upper-class were bred for more fashionable traits. In the same manner as white horses were reserved for royalty, noblemen may have also had special preferences that are beyond our present-day understanding,” the researchers reported. “Strikingly, the Icelandic horses from the Viking Age show clear differences from their modern counterparts. “The samples we analysed originated from graves around Iceland that date back to as early as the middle of the 9th century, shortly after Iceland was settled. “These horses already carried the allele for Silver dapple (two of 19 individuals), a common trait in contemporary Icelandic horses, but they did not carry any alleles associated with spotted phenotypes, although such individuals are frequent in modern Icelandic horses. Ludwig was joined in the research by Saskia Wutke, Norbert Benecke, Edson Sandoval-Castellanos, Hans-Jürgen Döhle, Susanne Friederich, Javier Gonzalez, Jón Hallsteinn Hallsson, Michael Hofreiter, Lembi Lõugas, Ola Magnell, Arturo Morales-Muniz, Ludovic Orlando, Albína Hulda Pálsdóttir, Monika Reissmann, Matej Ruttkay and Alexandra Trinks. The full study, published under a Creative Commons License, can be read here. Thank you Victoria for sharing this. That was a fascinating article, also in that it was very readable. A valued glimpse of the past.